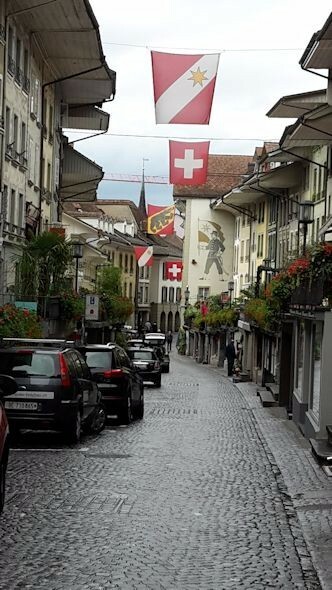 During the summer holidays, we decided to visit Interlaken in Switzerland. It was a nostalgic trip for Ray, as the last time he'd travelled there was with his school! 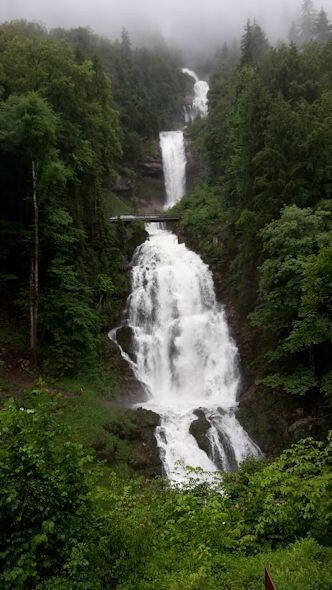 Interlaken lies in the Bernese Oberland, between Lake Thun and Lake Brienz and is presided over by the three mountains, Eiger, Mönch and Jungfrau. It was my first trip to Switzerland. For the flight from Gatwick to Geneva, we made sure we took Alpro soya milk in 100ml bottles from Muji www.muji.eu . After a tea (using their soya milk predictably) at Eat www.eat.co.uk , we purchased food to take on the plane. Ray found that most sandwiches contained milk or cheese, but was able to have a tuna and cucumber baguette as it had mayonnaise rather than butter (although he had to remove the cucumber as he can’t eat it). 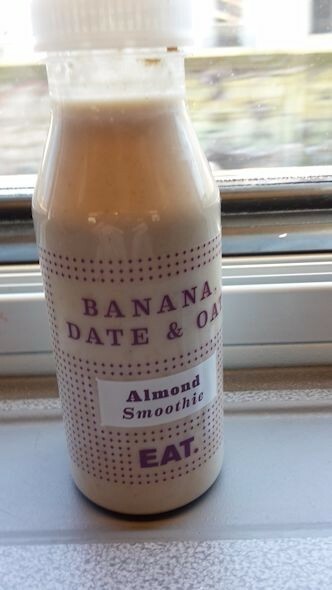 Ray tried the banana, date, oat and almond smoothie – delicious! There were no gluten free sandwiches so I opted for a tuna nicoise salad. Once on the flight, we were pleased to see that the EasyJet www.easyjet.com “Bistro & Boutique” menu has improved as items now carry symbols – v for vegetarian and gf for gluten free, but sadly nothing for dairy free (or vegan). The Mediterranean snack box comprises several items I could eat – green olives, roasted red pepper and feta cheese, hummus, but not the rosemary crackers or baklavas – so you could always give those items away. There’s a Mini Bites box with an all fruit mix, black pepper cashews, seeds, cranberries and dark chocolate which I could eat, omitting the Italian bread, which is included. Also, the Momo Porridge Pot unsweetened natural porridge served with 20g sachet of golden syrup is marked with a gluten free and vegetarian symbol. All in all, an improvement for gluten free people if you have no time to buy something at the airport, but not much for dairy free people. 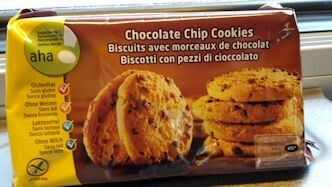 On arrival at Geneva, we found a supermarket called Migros www.migros.ch where we purchased soya milk, dairy free and gluten free biscuits as well as gluten free cakes. This supermarket doesn’t have a dedicated free from area so you have to search for products with the “aha” label or ask a sales assistant. We also found that the chemist Phamarcie Sunstore sold an extensive range of Schar free from products www.schar.com . 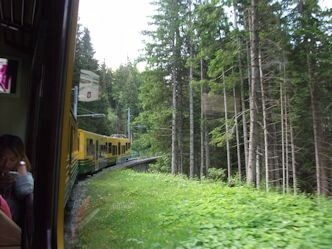 You reach Interlaken by two trains. The first journey (lasting two hours) was to Berne. On board the train, which didn’t have air conditioning despite 30 degree temperatures, there was little indication of any refreshment. Confusingly there were two levels on the train – ground floor and an upper floor accessible via stairs. After asking the ticket collector where the restaurant was, I went upstairs and walked through several carriages before I found it – an area with tables and chairs and glum-looking people. There was nobody serving, so I went downstairs to find a member of staff, who proceeded to give me two cups of boiling water until I pointed out there were no tea bags. She gave me some (there was no soya milk) and a cardboard carrier. It was a laborious journey balancing this back to our carriage and I only just remembered which staircase to descend to return to our carriage. We used the soya milk from one of our 100ml bottles. At Berne, we transferred to a smaller train, packed with holidaymakers and commuters, to Interlaken Ost, but be warned. Just before there is another stop called Interlaken West, where we disembarked only to find it was the wrong station so we waited five minutes for the next train to take us to Interlaken Ost. This must be one of the busiest stations as it’s the gateway to the Bernese Oberland area, recently visited by Theresa May, the prime minister. Our tour operator took us to our hotel the Hotel Royal St Georges www.hotelroya.ch right in the centre of Interlaken, usefully only a short distance away from the station. We were glad of the lift with all the luggage. 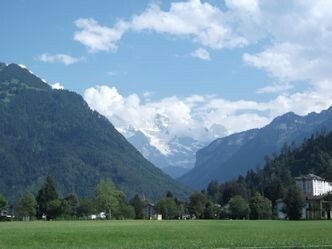 From everywhere in Interlaken, as you look up there are spectacular views of the mountains including Jungfrau, the highest mountain, also home to Jungfraujoch, the highest railway station in Europe at a height of 3,466 meters (11,371 ft) above sea level. 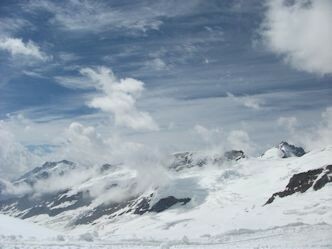 It is astonishing to view the snow-capped mountain and arresting views on every side. 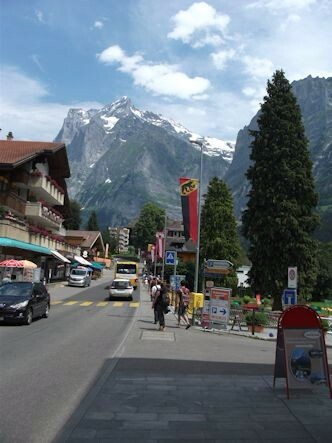 As we soon discovered, Interlaken is a meeting place of all nationalities including Arabs, Chinese, Koreans, Japanese, Asians, Americans and of course Europeans and Brits. We found the local Coop www.coop.ch opposite the railway station at Interlaken Ost where we stocked up on soya milk, which we kept in the mini bar. We soon discovered that there was no free from section. So the only option was to keep searching or ask a sales assistant, who might be able to help. Although we had alerted the hotel in advance via the tour operator Inghams www.inghams.co.uk that I was gluten free and Ray was dairy free, nevertheless we asked the reception staff to write down our allergies in German just in case. On many occasions we have alerted our hotel in advance about our allergies, but very often it makes no difference at all. But in this case they had really taken it on board. 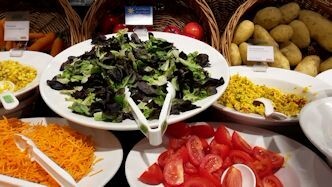 By mistake, we had purchased an all inclusive trip and so our evening meals were included. This was a happy accident because we quickly realised that eating in Interlaken is very expensive indeed! Another advantage was that the staff got to know us and our allergies, so by the end of the holiday they knew instantly what we could eat. 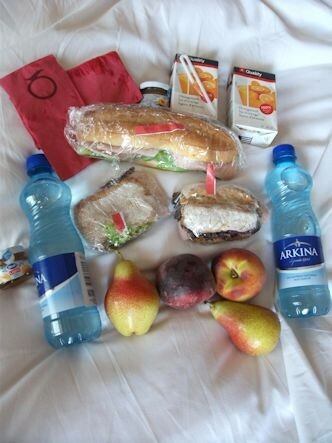 “Half board” also means that the hotel provided us with a packed lunch every day – gluten free and dairy free. This included gluten free rolls with ham and cheese and a baguette for Ray with ham, lettuce and cucumber, which he removed. Crucially it didn’t contain butter or cheese. Plus apples, pears, water and small cartons of orange juice. This was an unexpected bonus. We arrived just in time for our evening meal, which was served every evening at the hotel’s The Verandah restaurant. 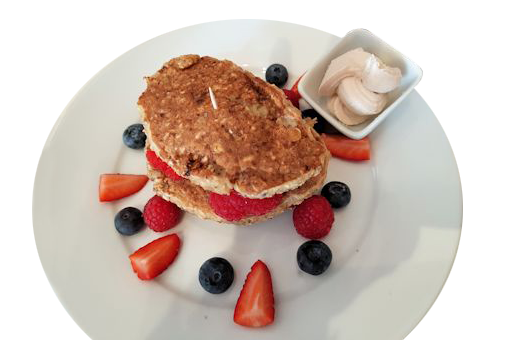 There were no gluten free or dairy free symbols, only a “weighing scales” symbol identifying dishes offering satisfying and healthy nutritionally balanced meals. We started explaining our allergies and intolerances. 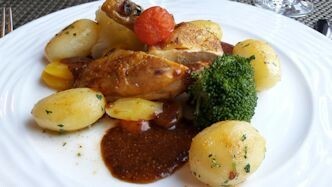 The waiter said he would check whether I could have the sauce on the main chicken dish. 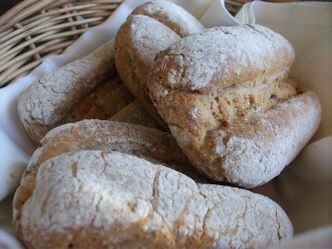 I was presented with gluten free bread, baked on the premises, which was impressive. Ray ate some and said he forgot it was gluten free bread whereas usually he can tell just after one bite. 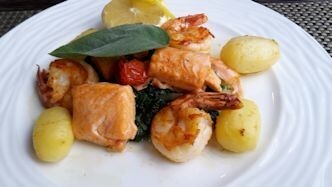 Here’s an example of one of our meals at The Verandah. We were able to have three courses, but soon found that one or two courses was ample. 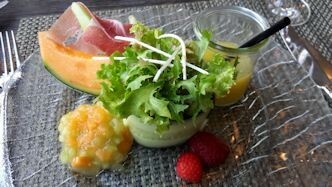 For starters, Ray chose Trilogy of Melon, Orange Jus with Bundner ham and salad bouquet, beautifully presented as the lettuce sits in a “bowl” made of rolled cucumber. 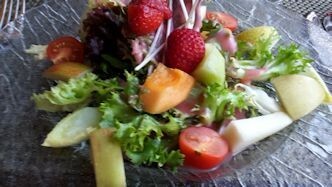 I enjoyed seasonal Mixed Salad with sprouts and fresh fruits with a raspberry dressing, unusual and refreshing. For the main course, for me it was crispy cornfed chicken breast with wholegrain mustard sauce with sautéed potatoes and vegetables – very delicious and beautifully presented. Ray joked with the waiter that perhaps the chef would need to prepare a special sauce for him as he was unable to have the mustard sauce. We laughed at this; the waiter said he would ask but he couldn’t promise anything. When Ray’s meal arrived sure enough he was served with a special dairy free sauce so we sent our thanks to the chef. Curiously, they still put the selection of butters on the table – standard, garlic butter and sour cream. 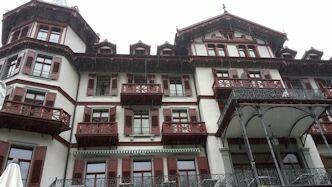 Ray remembered this hotel when he visited Interlaken as a schoolboy. “I saw it across the fields and thought ‘I’ll never stay there’ and here I am,” he said. 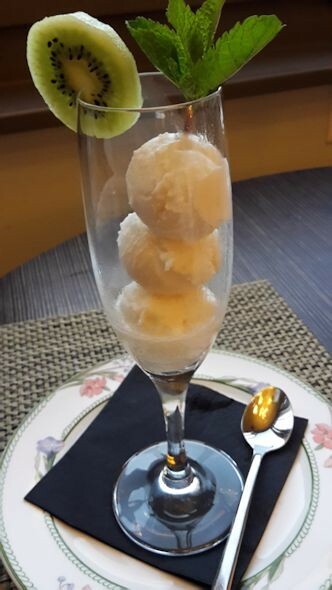 For desserts, I ordered fresh fruit salad, an exotic mix of grapefruit, water melon, pineapple and other fruits, while Ray had lemon sorbet. 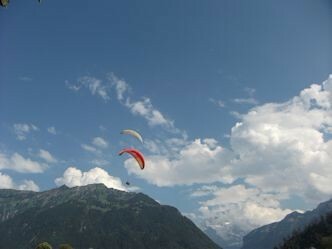 Every morning, we enjoyed the panoramic views of the mountains and Jungfrau and the early morning paragliders with brightly coloured sails and house martins swirling around the sky. Breakfast was buffet style so it was easy to see at a glance what we could eat. Soya milk was available alongside ordinary milk and I was provided with gluten free bread. 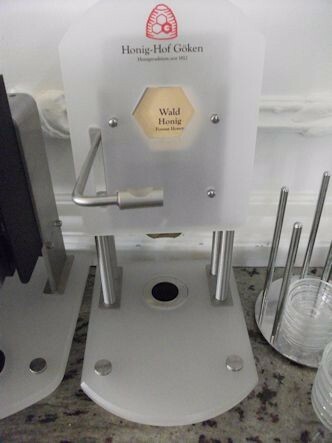 Unusually there was a machine which dispenses honey into a small bowl so you could have as little or as much as you wanted. Alongside this was a similar machine dispensing a whole array of jams such as cherry, strawberry and blackberry. 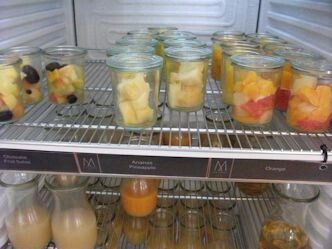 A chiller cabinet contained juices, fruit yogurts and quark. Each shelf was labelled so you could identify the items. Ray checked with a member of staff to see if the baked beans contained milk – they didn’t – so he ate bacon and baked beans, smoked salmon, toast and honey. It has to be said that the honey was absolutely delicious so I put some on my gluten free bread, as well as bacon. 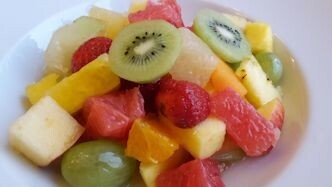 This was followed by fruit salad in a pot from the chiller cabinet and natural home-made yogurt in a pot. 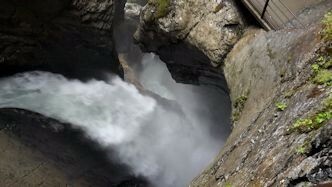 A rucksack is de rigeur in Interlaken. It is the ultimate fashion accessory for men and women so I bought my first – a lightweight red and black one which folds into a tiny square. It transformed my life. No more lugging a heavy handbag as the weight is evenly distributed on my back. So I simply packed it every morning with everything we needed including the packed lunches (Yes Ray shared the carrying). 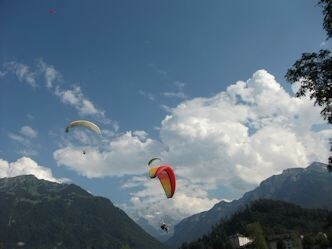 As we wandered round Interlaken we were amazed at the different modes of transport available. You can be driven in a horse and carriage, which is covered in rainy weather; you can hire a Segway, roller blades, bicycles – some with a trailer at the back for small children. It’s astonishing how efficient the Swiss public transport system is – buses, trains, boats – and how they interact with each other so perfectly. So when you arrive by train, the connecting one is waiting. On one occasion, our boat was late in leaving “as we are waiting for the people on the train connection.” The boat jetty was, in effect, one of the station platforms – integrated transport or what! 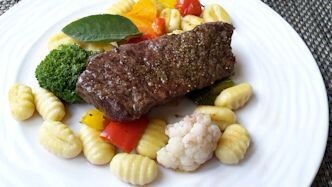 That evening at The Verandah restaurant, Ray ordered the grilled sirloin steak, seasonal vegetables and gnocchi while I indulged in sautéed cubes of salmon and prawns fried in olive oil with potatoes and spinach. Yummy. 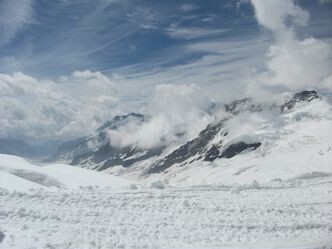 As we were warned the weather would change dramatically, we decided to go up Jungfrau “the top of Europe” the next day to ensure we enjoyed the best possible views. The first leg of the journey was from Interlaken Ost to Lauterbrunnen by train, a real transport hub not dissimilar to a mini Clapham Junction where people transfer to trains to other destinations. 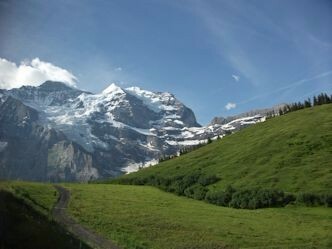 Then it was onwards to Kleine Scheidegg. Train travel in this area passes quickly as there are so many arresting views. 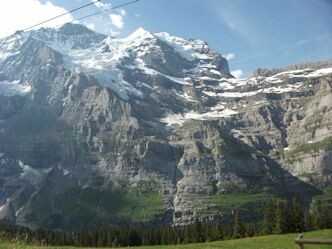 At Kleine Scheidegg, there was a mad panic for everyone to transfer to the train to Jungfrau. 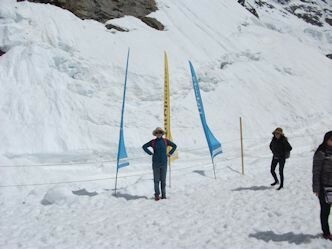 Some people left the train at Eigergletscher to walk the Eiger Trail. 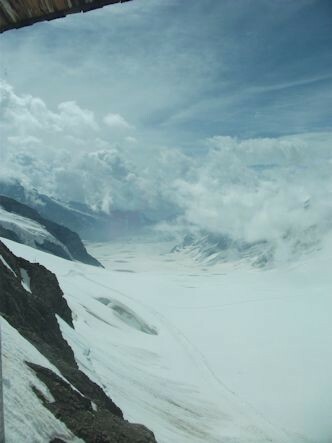 As the train passed through tunnels, we felt it ascend and began to feel light-headed because of the altitude. The train stopped for five minutes at the two stations before our ultimate destination so people could use the facilities and admire the view through huge windows strategically placed at the stopping points, although we suspect it was to allow people to acclimatise to the altitude. Many of our fellow passengers were asleep as we arrived at our final destination. The temperature dipped as we came out of the station so we quickly put on our fleeces, which did the trick. The advice was “walk slowly”, because of the altitude, which we did. We both had headaches, but when we emerged into the welcome area these were soon forgotten as we viewed the snow-capped mountain ranges through the windows. We walked through chilly dark corridors decorated with posters showing unusual events which had taken place on top of the mountain such as cricket and tennis matches. Outside on the plateau viewing area, we walked on soft snow but it wasn’t slippery and it was much warmer. The brightness was incredible but our sunglasses, (thoughtfully provided by our hotel) helped the glare. The views were spectacular as you can see from these pictures. All we could hear were whoops of delight from people zipwiring their way across. It truly was an awesome experience, certainly the highlight of the holiday. You can go a little bit higher to The Sphinx viewing level but we decided to skip this as we were finding it difficult enough to cope with the altitude where we were. 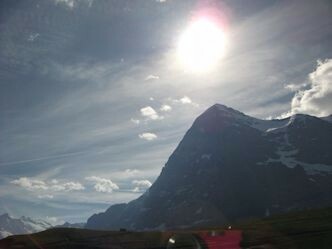 On the journey back down to Kleine Scheidegg, virtually everyone in the train carriage was asleep. 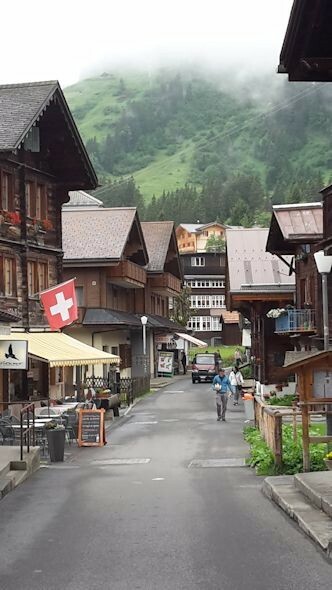 We stopped off at Grindelwald, a typical Swiss village with jaw dropping views of the mountains on every side. As it was 30 degrees heat, we strolled slowly along the pavements trying to find shade but it was impossible. 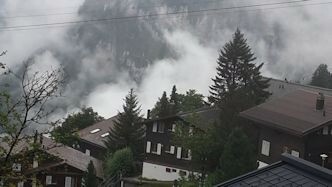 After a night of dramatic and noisy thunder and lightning, we were surprised (although relieved) to find the temperature had dropped to a more manageable 15 degrees but Jungfrau was shrouded in clouds so were pleased we had made the trip to the top of the mountain the day before for the best views. A leisurely boat tour around Lake Brienz was our next excursion. At 11.05am we boarded a 175 year old paddle steamer (this is the only steam operated boat) finding a seat outside for the best views, but everyone beat a hasty retreat inside as the rain lashed onto the deck from all sides and through a hole in the awning. By this time, the rain was much heavier, but even so some brave souls walked over the bridge, umbrellas in tow, to view the falls. 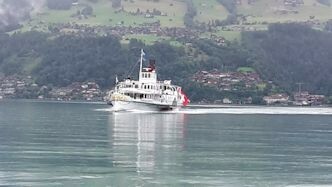 The boats from here to Brienz are every hour so be careful you don’t miss one as we did! You may wonder why there are no details about food. That’s because we had our packed lunches (gluten free and dairy free) so there was no need to look for anywhere to eat for lunch. This saved considerable time and money. A lesson to be learnt for future trips. 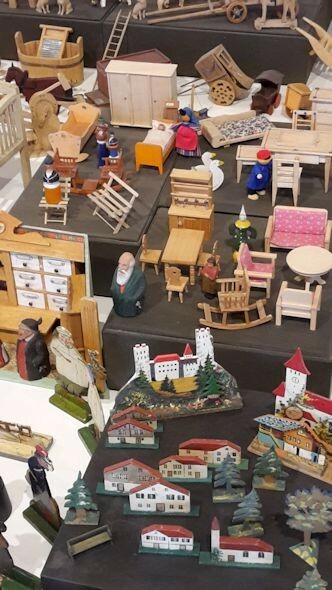 Our next stop was Brienz, where the tourist board (just opposite the jetty) gave us a map and directions to the wood carving museum http://www.interlaken.ch/en/woodcarving-museum-brienz-jobin.html This is worth a visit to see all the amazing creations that have been carved in wood – everything from bears to toy ducks, as well as collections of wooden boxes, cuckoo clocks and musical boxes. 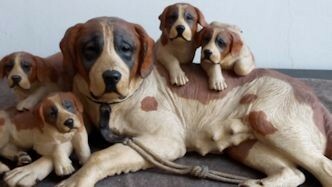 Wander further down the road to Jobin www.jobin.ch where you can see the wood carvers at work and even farther to the ancient part of town – beautiful traditional wooden chalets adorned with flowers. 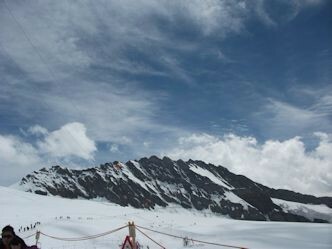 Ray wanted to see Murren, which he visited as a boy, but despite the poor weather and visibility we decided to set out. 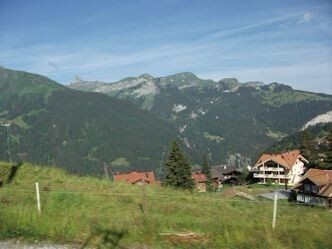 Murren is high in the alps nestling on the side in a deep valley and is famous for having no access for cars. 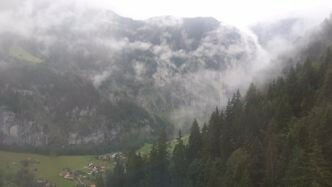 After taking the train to Lauterbrunnen, we then crossed to the Murrenbahn cable car to Grutschalp. Although the views were limited because of the mist, it was still spectacular. The first time the cable car passed over the pylon the car dipped and swung causing several people to gasp and “ooh”. It was a bit of a shock, but by the second pylon we were expecting it. At Grutschalp we took a further train to Murren. We found a cup of tea with soya milk at The Alpine Spa. We were told they usually had gluten free cakes, but not today, although there were gluten free energy bars. Wandering round the village we saw typical Swiss chalets with colourful window baskets, although it was too misty to see much of the mountains except the occasional glimpse of cows and farmland. 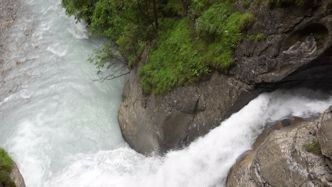 From Murren, we took the cable car down to Stechelberg and then a bus to the Trummelbech Falls – a place Ray wanted to revisit. After a short walk across the terrain to the mountains, we took an underground elevator – an exhilarating ride up through the inside of the mountain to the falls. There are several places where you can get astonishing views of the falls – where the torrent has cut its way through the mountain. The viewpoints have been conveniently numbered 1 to 10, so we decided to look at number 10 first – a further couple of flights of steps up. We found this was the most striking view. The water roars through the rocks which have worn away over aeons, vapour rising as it gurgles down the rocks. A fine spray covers my glasses like fine rain. It’s fresh, invigorating just like a toothpaste advert, a light smell of mint pervading the air. People carefully lean over the railings to get pictures. 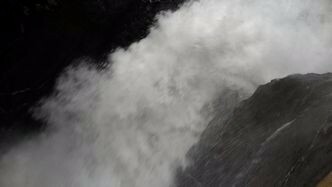 The falls are spectacular and the power of the water as it cuts through the rocks is incredible. The packed lunches were a godsend as we didn’t have to search for restaurants where we might be have been able to eat something. The only day it didn’t work is when salami was mistakenly put in our sandwiches – a lesson to be learnt – “keine salami bitte”. (Salami tends to have milk and gluten in it). 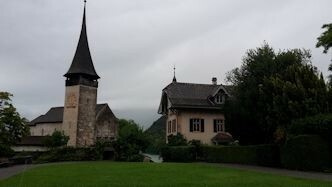 We took the bus back to Lauterbrunnel and from there, the train back to Interlaken Ost. 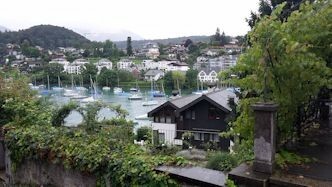 On the next day we took a leisurely cruise down Lake Thunersee, picking up the boat from Interlaken West, a short walk from our hotel. We disembarked at Spietz to stretch our legs. Although it was raining, we continued to have a stroll round the castle and grounds. 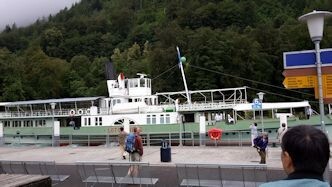 At the quay, we had a close up view of the paddle steamer collecting passengers for Interlaken West. 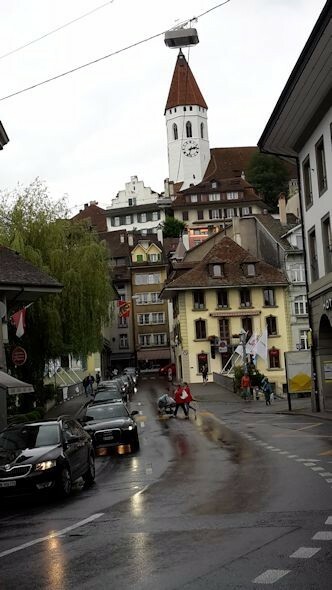 Our boat took us to Thun, a much larger town than expected. The castle is the highlight, although we found a street with specialist shops - for example, one for guitars and another for cat lovers. There was also Muller www.mueller.eu , a small department store which sold a selection of gluten free and dairy free food, so we bought some cakes. As the cruise to Thun took two hours, we decided to take a train back, as it had been a long day. Back at Interlaken West, we discovered Mylos supermarket with its upmarket café selling all sorts of food and an extensive choice of cakes. Sadly there were no gluten free or dairy free cakes although we were told they were for sale in the supermarket. Like the Coop, there was no free from section, although the Mylos supermarket at Geneva airport did have one. We were told to look for the symbol denoting gluten free or dairy free. 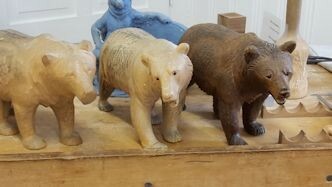 These were few and far between although we did find a couple of cakes. 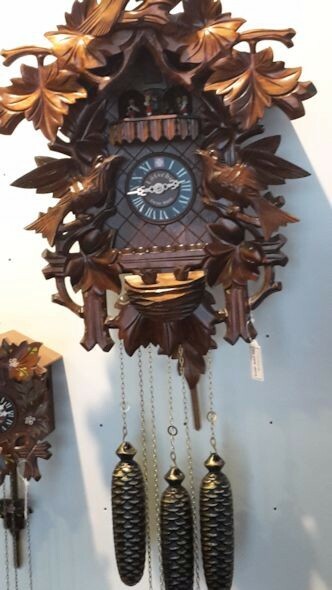 This was only because a sales assistant pointed them out to us. I truly hope the UK doesn’t stop having free from sections in supermarkets as it’s so time-consuming finding free from products when they’re placed with everything else on the shelf. 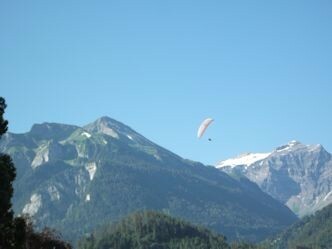 We returned from Interlaken rested, relaxed and full of energy. It’s a wonderful place, well recommended, although expensive, so we are starting to save up for our return trip.